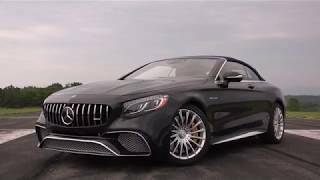 Scheduled to release at the 2016 Detroit Auto Show, the Mercedes-Benz S65 AMG Cabriolet 2017 is a remarkable blend of luxury and sports coming from the house of Mercedes. To be mentioned that the model takes the legacy created by AMG S63 a lap ahead with its features and looks. 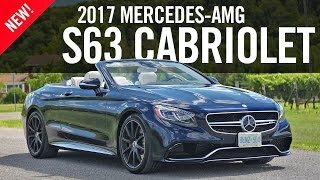 Let us have a look at the detailed review of Mercedes Benz S65 AMG Cabriolet 2017 to know in detail about the model. The major difference in the interior of Mercedes Benz S65 AMG Cabriolet 2017 is the features that you get and the inserts made. Behind the AMG flat-bottom steering wheel is the instrument cluster presenting all vital information through its animated round dials getting featured through the 12.3 inch TFT display. Model is equipped with Aircap and Airscarf while the armrests and rear seat come with heating feature. Getting to the tech features we have a heads-up display and the touchpad making your user experience better. The former brings to you navigation directions, traffic signs, vehicle speed and speed limits. 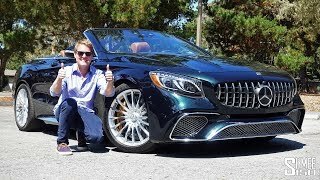 Thus rounding up the interior details of Mercedes Benz S65 AMG Cabriolet 2017 I would say, it’s gorgeous, luxurious and tech loaded. The exterior of Mercedes Benz S65 AMG Cabriolet 2017 at first glance might feel identical to the S63 sibling; however a closer sight will bring some good changes. Starting with the front fascia, it has high-sheen chrome elements around the grille, air intakes and the splitter. The front bumper looks really aggressive with those massive air intakes while the emblem in the center of the grille adds further to the glory. Getting to the rear end you’ll notice the sporty side skirts amidst the set of new multi-spoke wheels. The rear end of the model has S65 badge over the trunk lid while the V12 Biturbo lettering adorns the wings. Beneath this setup we have the quad exhaust pipes and a high-gloss diffuser insert adding to the aggressive stance of the model. 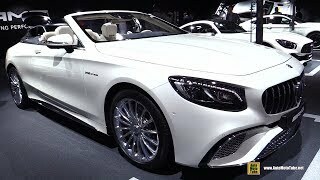 Thus concluding the exterior details of Mercedes Benz S65 AMG Cabriolet 2017 we can say, the luxurious and sportive glory of interior very well gets complemented by outside design. Beneath the hood of Mercedes Benz S65 AMG Cabriolet 2017 is a 6.0 liter V12 engine generating total output of 621 hp and peak torque of 1000 nm paired to AMG’s Speedshift 7G- Tronic transmission. With this power rolling the model the top speed of Mercedes Benz S65 AMG Cabriolet 2017 touches the electronically limited mark of 155 mph. However buyers do have the option to enhance it further to 186 mph by opting AMG Driver package. The model can sprint from 0-62 mph in just 4.1 seconds.